During the last three decades, technological innovations in cargo handling equipment have made it possible to automate operational processes in container terminals. Despite the increasing trend in terminal automation, little work has been done to develop theoretical guidelines for evaluating the benefits of this industrial practice. We assess terminal automation by focusing on whether strategic content and process structure are aligned. In this study, we explore the reasons that these results are mixed in the context of service automation. Have market competitiveness and operational performance been enhanced by automation in seaports? We focus on two key strategic elements and their proper alignment to produce the best performance for a port. The first element is the overall business strategy and strategic content adopted by the port. In this study, we look at Porter’s (Competitive strategy, Free Press, New York, 1980) generic strategic classification of low cost, differentiation, or focus strategies. The second element is the process structure of the port, which may have been impacted by technological innovation. Using the framework of contingency theory, we explore the interface of strategic content and process structure and how this interface impacts the service process automation. A multiple case study is conducted on a sample of 20 container terminals, selected from the list of 2014 Journal of Commerce’s Top Productive Terminals. We come up with three important findings. First, a port’s strategic market position determines the choice of overall business strategy. If a port is strategically positioned as an international gate, then it should adopt an overall cost-leadership strategy, whereas a transshipment terminal should adopt an overall differentiation strategy. Second, we find that the process structure adopted is associated with the level of automation, and a differentiation strategy is dependent on the level of flexibility, speed, and reliability. Higher market uncertainty requires higher flexibility, while lower market uncertainty requires greater speed and reliability. Third, the level of process automation depends on throughput volume and stability. Closer relationships with maritime supply–chain partners help increase throughput volume and reduce throughput uncertainty. The original version of this article was revised: the author name Qingcheng Zeng was misspelt and the authors sequence was incorrect. A correction to this article is available online at https://doi.org/10.1057/s41278-018-0100-5. The fast growing global container trade confers container terminals more strategic roles in global supply–chain logistics (Fransoo and Lee 2012). Along with the technological innovations in ships and handling equipment, there is a salient trend in automating the service processes of moving containers within and/or through the terminals timely and reliably (Leachman 2008). However, a recent industry report reveals that the best performing container terminal is still manually operated, thus calling for further investigation on whether container terminal automation effectively improves business performance (JOC 2014). The automation of operational processes in both manufacturing and service sectors has been viewed by practitioners as a “silver bullet” to improve operational efficiency (Kotha and Swamidass 2000; Ponsignon et al. 2011; Collier 1983). In manufacturing settings, it has been recognized that production process automation can provide a combination of flexibility and efficiency to end-users (McDermott and Stock 1999) and is critical to the implementation of manufacturing strategy (Boyer et al. 1997). In service settings such as logistics, service processes have been automated in order to improve efficiency and effectiveness (Bamber and Lansbury 1998). However, automation processes and productivity enhancements in both manufacturing and service settings have been mixed (Voss 2003; Levitt 1976; Collier 1983). For example, the UPS Worldport distribution hub at Louisville, Kentucky, is a facility that can sort 115 packages per second and turn 130 aircrafts daily. […] It brings both the scale and the technology to keep one of the most advanced logistics networks running in peak condition…, said Bob Lekites, the president of the UPS Airlines (Kadaba 2003). On the contrary, Foxmeyer, the second largest wholesale-drug distributor in the U.S. in 1996, with sales over $5 billion dollars in such a highly competitive industry, invested heavily in a new ERP system and a highly automated distribution center. The company expected to gain a huge efficiency and better market position, but the investment turned out to be a disaster! The company eventually was sold to McKesson for only $80 million. Whereas there have been many attempts to explore the theoretical reasons underlying the mixed outcomes of process automation in manufacturing (Boyer et al. 1997; Kotha and Swamidass 2000), there has been a relative dearth of efforts to build a cohesive theory of service process automation. Specifically, there is a paucity of theory development explaining the relationship between service process automation and business performance for the logistics service industries. Moreover, there has been little research conducted on the prevailing trends of process automation in seaports such as warehousing, cross-docking, and container terminal operations. In this study, we explore why these results are mixed in the context of service automation. We ask, have market competitiveness and operational performance been enhanced by automation in seaports? We focus on two key strategic elements and their proper alignment to produce the best performance for a port. The first element is the overall business strategy and strategic content adopted by the port. Here, we look to Porter’s (1980) generic strategic classification of low cost, differentiation, or focus strategies. The second element is the process structure of the port which may have been impacted by technological innovation. Using the framework of contingency theory, we explore the interface of strategic content and process structure and how this interface impacts the service process automation. The remainder of the paper is structured as follows: First, we review the current literature and develop a theoretical background on the proper alignment of strategic content and process structure and present the conceptual development. Second, we review our research design and research methodology. Third, we present the method of data analysis and address research questions. Fourth, we discuss the implications of research findings and their limitations. Finally, we present the conclusions and future research directions. The interface between content and process structure leads to the review of the Service Strategy Triad, the interaction of strategy, structure, and internal processes (Roth and Menor 2003). The service strategy triad emphasizes the interactions among strategic content (which markets to serve), service concept (what service packages are to be offered), and service delivery process (how the service is to be delivered) (Roth and Menor 2003). From a port’s perspective, this is operationalized into who are the port’s customers, what port services will be provided, and how those services are delivered as a process which can be manual, semi-automated, or fully automated (Ponsignon et al. 2011). It has been well documented that the alignment of strategy, structure, and processes is important to competitiveness for a service business (Roth and Menor 2003). The proper configuration of the service delivery process and the notion of “strategic alignment” can be evaluated on the basis of the “fit” between business strategy and processes, and the “fit” between business strategy and operational objectives (Verma and Young 2000; Johansson and Olhager 2004; Johnston and Clark 2005). Moreover, it has been recognized that alignment issues have been well investigated by scholars, with regard to the fit between the notions of strategic alignment which is constrained by other factors such as market dynamics, operations capability, and technology availability. In general, research on the alignment between business/operations strategy and organizational structure falls in a broader strategic research stream known as contingency theory, or the “strategy-structure” literature (Chandler 1962; Galbraith 1995). Additionally this strategic research stream considers competitive environment and overall corporate strategy. Porter (1980) best describes overall corporate strategy by classifying strategies in three categories of low cost, differentiation and focus. Operations and logistics strategy scholars classify strategy schemes in various ways; however, the scheme of “cost-quality-delivery-flexibility-innovativeness” is the most prevalent (Chase and Aquilano 1995; Miller and Roth 1994; Leong et al. 1990; Cooper and Ellram 1993; Stock et al. 1998). Under this strategy scheme, there is an emphasis on delivery, measured by speed, reliability, and flexibility in order to realize the strategic roles of logistics either as an industry or as a business function (LaLonde and Masters 1990). In this study, we explore the interface of the strategic foci of logistics service operations with the service delivery process structure of a port. This interface can result in treating cost as an overall goal of “minimizing total system cost” in all service businesses (Chase and Aquilano 1995); thus achieving the generic “cost-leadership” corporate strategy. However, when speed and reliability are the logistics strategy, the interface will support an overall differentiated corporate strategy. Corporate strategy and process structure must be strategically aligned to result in best performance. In the case of container terminals, both the content of the overall corporate strategy and the process structure of a port are impacted by contextual variables. Contextual variables are also defined as market dynamics variables. Market dynamics has significant contingent effects on the formation and execution of business strategy, and on the design and implementation of operations processes/systems (Venkatraman and Prescott 1990; Leong et al. 1990; McGinnis and Kohn 2002). Market dynamics can be operationalized as the dynamics of source and demand, the environment stability, the level of industrial competition, or the life-cycle of technology. We explore which of these market dynamics variables are critical for the proper alignment of overall corporate strategy and process structure manifested through decisions regarding service process automation. The alignment between strategy and process will determine the level of process automation. We use container terminal operations as our research setting. Further, we evaluate the level of automation as the operationalization of the proper alignment of strategy-structure process. In container terminal operations, there are two major value-added processes: loading and unloading. We use the Hayes and Wheelwright (1984) product–process matrix. The matrix predicts levels of flexibility for the volume of cargo. We can use this matrix to evaluate the loading/unloading process structure in a container terminal. The items to be served in this process are either a 20-foot or a 40-foot container. We treat both types of containers the same, since most handling equipment in container terminals can handle two 20-foot containers together as handling one 40-foot container. We can conceptually view the entire container loading and unloading process as a continuous process, characterized by sequentially connected sub-processes with no variation on its service content. The importance of this conceptual view is to further evaluate the process structure, as to where automation should occur and at what level to ensure strategic alignment. We would anticipate that since container terminal cargohandling regards similar cargo with high volume, low cost combined with low flexibility would be the emphasis of this service process under the Hayes–Wheelwright matrix. Process automation is defined as the level of human interaction with equipment and technology during the value-creation process. In general, the goals of automation are to minimize total system cost by reducing labor cost, and to improve process stability and system reliability (Ritzman and Safizadeh 1999). We further adopt the structural–infrastructural framework from manufacturing process automation (Leong et al. 1990) to evaluate decisions relevant to service process automation. We use this framework to review the physical structure and facilities of the port and their interactions with management processes. Particularly, this paper focuses on physical structure and facilities, including location, layout, facility, and equipment. In addition, we take the balanced and holistic approach recommended by Diaz Garrido et al. (2007) by examining overall processes including all interconnections of consecutive subprocesses. This evaluation can determine what the appropriate level of automation should be. 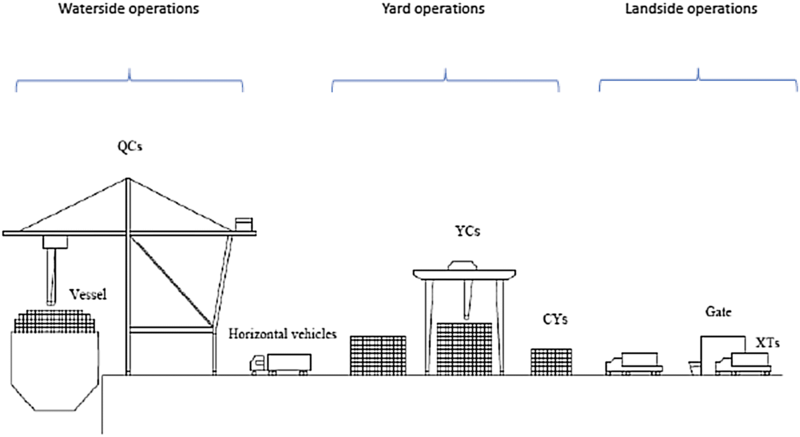 We review the loading/unloading processes in 20 port container terminals in this study. In a global containerized supply chain, there are multiple entities—typically including suppliers, buyers, logistics service providers (LSP), or non-vessel operating common carriers (NVOCC), hinterland carriers, terminal operators, and ocean carriers. Service delivery processes in container terminals offer us an excellent opportunity to explore the association between strategic content and service process structure. The handling of containers in terminals consists of THREE related subprocesses connected with waterside operations, yard operations, and landside operations. Figure 1 shows a typical terminal operations system. The waterside operations load or unload a container vessel with quay cranes (QCs). Yard operations primarily undertake the tasks of storage or assortment of containers in zoned areas called container yards (CYs). Landside operations deal with other carriers from either road or rail to receive or dispatch containers. The transportation of containers between quayside and container yards is performed by horizontal vehicles such as yard trucks (YTs), straddle carriers (SCs), automated guided vehicles (AGVs) or automated lifting vehicles (ALVs), and the yard operations are performed by yard cranes (YCs) such as rail-mounted gantries (RMGs), rubber-tired gantries (RTGs) or automated stacking cranes (ASCs). Meanwhile, the pickup or deliver of containers are performed by external trucks (XTs). Whether or not these equipments are automated helps determine the level of automation of each subprocess these equipments are primarily serving. The unit of analysis is set as ‘container terminal’. As the nature of this research is explorational, a multiple case study method is deemed appropriate (Eisenhardt 1989; Voss et al. 2002; Yin 2013). Such a method will help to address the questions of “what” and “how” in a way that facilitates the construction of a near-complete picture of the phenomenon (Meredith 1998). Moreover, a multiple case study provides an opportunity to obtain rich insights necessary for theory development (Strauss and Corbin 1997) and to formulate research propositions for future research (Eisenhardt 1989). A case study protocol is designed with detailed descriptions about research questions, cases’ selection criteria, several sources of information, dataset structure for data storage and retrieval, and data collection and analysis procedures. Such a protocol ensures that data collection, coding, and pattern-matching procedures will be robust and consistent, which will further ensure the validity and reliability of the multiple case study (Yin 2013). The criteria for interpreting the results explain how the patterns discovered lead to propositions. We take the two-step theoretical sampling approach to choose the sample and determine its size (Miles and Huberman 1994). The population is the 60 best performing container terminals listed in the JOC’s 2014 world container terminal productivity report (JOC 2014). Productivity is measured by throughput efficiency which is the number of container moves per berth per hour. JOC collects this information from 17 shipping lines from more than 150,100 ship calls globally. The data represent 75% of the global container trade volume in 2013, involving 483 ports and 771 container terminals scattered in three major regions: America, Asia, and Europe-Middle East-Africa (EMEA). Following the procedure recommended by Strauss and Corbin (1997), we set the sample size in the range between 16 and 20. This represents the number of cases needed to evaluate and generalize within/across quadrants defined by the high and low values of two separate variables of interest. A number of criteria were considered when selecting the final sample. First, we chose about the same case numbers between Asia (the supply side) and America and EMEA (the demand side). Second, we balanced the numbers of manned terminals with those of fully/semi-automated ones. We found 20 terminals meet our criteria after such initial screening, with 10 cases from Asia and 10 cases from America and EMEA. The demographic information of the 20 cases is provided in Table 1. Market position is indicated as international gate (Gate) or transshipment (TS). An international gate is one in which more than 65% of the cargo volume is either import or export. Transshipment is one where the majority of the cargo is reshipped. All ports in our sample have an element of both market positions. The level of automation is determined on the basis of where and how the automated equipment is used, and there are three levels: manual, semi-automated, and fully automated. Manual means the absence of automated equipment. Semi-automated means the presence of automated equipment in one or two of the three operational processes. The equipment consists of quay cranes (QC), automatic stacking cranes (ASC), straddle carriers (SC), automate lifting vehicles (ALV), yard trucks (YT), automate guided vehicles (AGV), and rail-mounted gantries (RMG). Layout refers to the three types of ‘layout’ which refer to the relative directions of the container yard (the moving direction of a yard truck when picking up/dropping off a container) and the quayside: parallel, perpendicular, or hybrid. The data presented in the Table 1 is obtained from multiple sources of information such as industrial reports, news media, port websites, and market analysis reports. The data is verified from multiple sources to justify its accuracy. In addition to the multiple archival sources of data, the research team has collectively visited more than 50 terminals. Of these, there were four multiple terminal expansion or construction projects which involved terminal automation (i.e., four ports in China: Shanghai, Tianjin, Xiamen, and Dalian). All researchers have vast port terminal knowledge through business and research experience. This experience served as the basis of the open question, semi-structured interview instrument (Yin 2013). The researchers collected and analyzed data for the sampled cases. In order to follow the general principles of grounded-theory and address the interrater bias issue (Eisenhardt 1989), the data were independently catalogued through both the coding process (i.e., “open coding” and “axial coding”) (Yin 2013) and the pattern-matching process (i.e., compiling temporary results periodically to see if there is a pattern emerging, until no new information is found, thus reaching the “saturation point of case study”) (Miles and Huberman 1994; Yin 2013). Such an iterative process of data collection and pattern matching helps generate conceptual categories based on the evidence; compare those categories to concepts from prior research; and circle back to refine the conceptual categories based on comparisons. This process assists the researchers’ understanding of a phenomenon, but also helps to perfect the description of the phenomenon that accounts for much of the relevant behavior for theory development (Strauss and Corbin 1997). In this study, this process identifies the alignment of the strategy content with the process structure of port. Business strategy defines a market that a company positions itself to serve. Using the Porter (1980) model, we use Marketing Position as a proxy of business strategy. Market positioning is reflected through the company’s overall strategy such as cost leadership, differentiation, or focus (Porter 1980). In the case of container terminal business, market position is conventionally defined as either international gate (Gate) or transshipment terminal (TS). For a port, market dynamics is categorized through throughput volume and uncertainty (i.e., the relative strength of volume increase with regard to national or global growth rate in the number of TEUs handled); sub-regional competitiveness (i.e., the subregion(s) covered by the terminal, which is the ratio between its volume and that of its competitors nearby); and technology innovation and advancement in the marine shipping industry. For example, in November 2014, the rapid throughput growth of the container volume in the Shanghai metropolitan area motivated the Port Authority of Shanghai to add another five midsize container berths and two large container berths. A similar example is the TraPac automated container terminal project in the Los Angeles Long Beach area which aims at improving its subregional competitiveness among the container terminals along the west coast of the United States. The process structure in a port is operationalized by the Level of Automation. The level of automation reflects the proportion of a service process performed by automated equipment. There are 10 terminals in our sample that use manually operated equipment in all three sub operational processes in the port described above, while other 10 terminals use partially automated equipment (in one or two operational processes) or fully automated equipment (in all three operational processes). Facility Layout or the design of the port highly impacts its level of automation. The layout of a facility is defined by whether the direction of container movement in the container yard is perpendicular or parallel to the longest quay side (i.e., the direction a ship is berthed). Terminals using automated equipment have the perpendicular type of facility layout. On the opposite side, all manually operated terminals in our sample have the parallel type of facility layout. 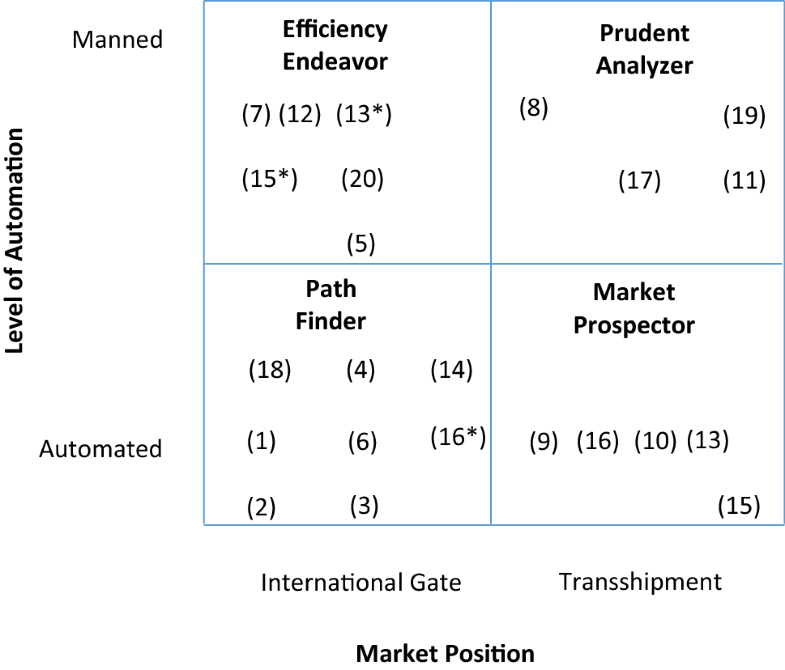 Figure 2 presents a categorization of our sample (the numbers represent each port case study) on the basis of their market position (i.e., Gate versus TS) and the level of automation (manual, partially automated, and fully automated).During our analysis we identified two factors that better address our research question. The two factors are market position and level of automation. We propose a typology with regard to these two factors. This typology defines four quadrants, and we name them as Efficiency Endeavor, Prudent Analyzer, Path Finder, and Market Prospector, respectively. Efficient Endeavor represents the quadrant of manually operated (i.e., manned) service processes with market position as international gate, and Prudent Analyzer the quadrant of manned service processes with market position as transshipment. Path Finder and Market Prosper represent the two quadrants of automated service processes with international gate and transshipment as their market positions, respectively. Among these 20 terminals, we find six terminals currently operating as Efficient Endeavor, eight as Path Finder, four as Prudent Analyzer, and the remaining two as Market Prospector. Three terminals (13, 15, and 16) are moving from their original quadrants to Market Prospector by changing their market position to transshipment strategy and automating their service processes if they are currently manually operated. As a result of the findings we develop propositions for further testing. Four strategic operational foci of the container operations process, which emerged from the cases studied, include cost, reliability, speed and flexibility, similar to previous research (Chase and Aquilano 1995; Miller and Roth 1994; Leong et al. 1990; Cooper and Ellram 1993; Stock et al. 1998). Cost reduction can be the general motivation of service process automation in the quasi-manufacturing setting. The primary motivation for automation for both international gates and transshipment terminals with higher throughput growth rate and regional competition is to minimize the total cost of terminal operations. Reliability can be the second motivation for terminal automation whether currently under operation or in the planned stage for the near future. This second motivation is particularly prevalent in transshipment terminals. In fact, reliability is a premier measurement of service quality for both shipping lines and terminals, reflecting their capability to meet with the planned schedules. Speed can be also a major motivation claimed by automated container terminals, to reduce overall service time such as ship “berthing time”. Flexibility can be the final strategic operational focus emerging from the sampled terminals and their service delivery systems. Flexibility can be reflected in the capability to berth different sizes of ships and the level of tolerance due to the variability on the landside and waterside operations. International gate business strategy better aligns with cost-leadership strategy improving performance. Transshipment terminal business strategy better aligns with the differentiation strategy improving performance. Level of automation is increased with throughput stability and volume. Level of automation is decreased with throughput uncertainty. Many port authorities prefer to delay the automation of some of the processes until the benefit of terminal automation is fully justified, as in the case of BNCT in Korea and Global Terminal in New Jersey. Both were designed to be fully automated terminals but they were only partially automated as of the end of 2014 when this study collected the data. The level of automation is determined by the level of stability in throughput. The strength of supply–chain relational ties moderates the level of automation. Transshipment or hybrid terminals with higher strategic foci on speed and reliability are more automated and more willing to automate their service processes. Transshipment or hybrid terminals with higher strategic focus on flexibility are more willing to retain their manned service processes. This study reveals two important factors in analyzing strategy-alignment between overall corporate strategy and process structure. For container terminals, these two factors are market position and level of automation. We propose a typology with regard to these two dimensions, as shown in Fig. 2. This typology includes four quadrants, similar in some respects to Miles, Snow, Meyer, and Coleman (1978). However, we address the four quadrants as Efficiency Endeavor, Prudent Analyzer, Path Finder, and Market Prospector. The “Efficient Endeavor” quadrant includes ports that have the market position of international gate, with the process structure of manual operation system. Most of these ports use typical manned equipment such as RMGs (with less maneuverability) or RTGs (with little better maneuverability) and yard trucks. Their original strategic focus is low cost strategy, taking advantage of relatively low productivity costs. Yokohama, Japan is an example of the “efficient endeavor” port with globally envied well trained labor. The “Prudent Analyzer” quadrant includes ports with a transshipment strategy. In cases in this quadrant, automation is low with an emphasis on flexibility. However, ports maintain good reliability and wait to justify automation by evaluating the benefits. A notable example is Singapore, which remains competitive and retains market position with this flexibility. Ports can move between the quadrants as they actively change strategies. Some of them, with a financial capability, have been changing their market positioning to transshipment, and aggressively implementing terminal automation. They are trying to simultaneously focus on both cost and reliability while expecting to keep or increase their throughput. In some cases, financial concerns halt some of their pace toward full automation as the benefit of automation has not been justified yet. With references to this typology, we show that the proper alignment of business strategy and process structure enhances performance. Further, if a port tries to move between quadrants it is important to consider both overall strategy and process structure. Automation may result in overall lowers cost, can be expensive so the up-front cost may be fully realized in lower cost. However, reliability might be the true benefit of automation. If a port tries to change overall strategy, the volume and stability of its throughput are critical factors to successfully change strategy. Strategy change brings new challenges with respect to container throughput. While this study provides some valuable insights, it has some limitations due to the nature of the case study methodology. First, most data are collected from archived secondary information that is publically available. Compared with the face-to-face interview approach, this data collection approach does not allow the researchers to interact with respondents on issues that are not included in the published data but may be potentially important. Second, while the data are collected from a sizable sample of container terminals, the generalizability of research findings to other service contexts may be limited. Research using larger samples in other quasi-manufacturing settings is needed to justify our research findings. Service process automation in container terminals plays an important role in the global containerized supply chain, but little theoretical exploration has been conducted in order to understand the alignment between strategic content and process structure. We use process automation levels as a means to better explain this alignment in port operations. This study was grounded on the practices and analysis of a sample of 20 container terminals from the list of JOC’s High Productivity Terminals. The theoretical contribution of this study is threefold. First, the development of a typology connecting strategic positioning with the level of automation buttresses the contingency stream of strategy-alignment research. 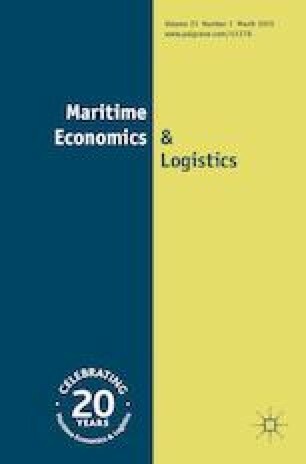 Second, this study fills the gap in the area of theoretical research under the quasi-manufacturing service context by exemplifying that the factors and their impacts on the operations systems are different from those in the manufacturing setting, or in pure or mixed service settings, particularly the importance of flexibility in a port. Third, research findings show that the overall cost-leadership strategy can be enhanced only by the proper alignment with the process structure. For a port, speed and flexibility can also help to reduce costs. Implication for management practice suggests that terminal operators should not simply move toward service process automation without thoroughly taking into consideration the market dynamics and projected benefits. Moreover, improving process performance and capabilities may be best served by enhancing relational ties along the supply rather than simply automating some or all segments along the operation process.